According to the writer Malcolm Gladwell, 10,000 hours of practice is what it takes to become world class at most things. Part of the reason the Beatles were the Beatles, he says, is that they spent so many hours playing dingy rock clubs first. Gladwell’s principle comes to mind when I think about another statistic: Over a lifetime, the average American woman will spend about 40,000 more hours cleaning, cooking, and caring for children than the average American man. If Gladwell is correct, that gives every man enough extra time to become John, Paul, George, and Ringo. I wonder what amazing things women could accomplish if they had their choice of how to spend those 40,000 hours. One of the most surprising things about this time gap is that it seems to fit the America of 50 years ago better than the America of today. Back then, theexplicit ideal of family life was a mother and a father in separate spheres, one domestic and the other professional. But things have changed a lot since then. I can see that very clearly when I compare my mother’s life and my daughters’ lives. Now, women can be anything they want to be, and a lot of men are unapologetically enthusiastic about cooking elaborate meals and cooing back and forth with their babies. The problem is that while the written rules are different, the unwritten rules haven’t changed as much as we might like. Girls my daughters’ ages — they are 13 and 20 — might not have quite as much freedom as they think they have — or as much as they deserve. The explicit norms that organized people’s time 50 years ago have become implicit assumptions that run our lives today. I first came to this issue, which experts call time poverty, through my work in global development. 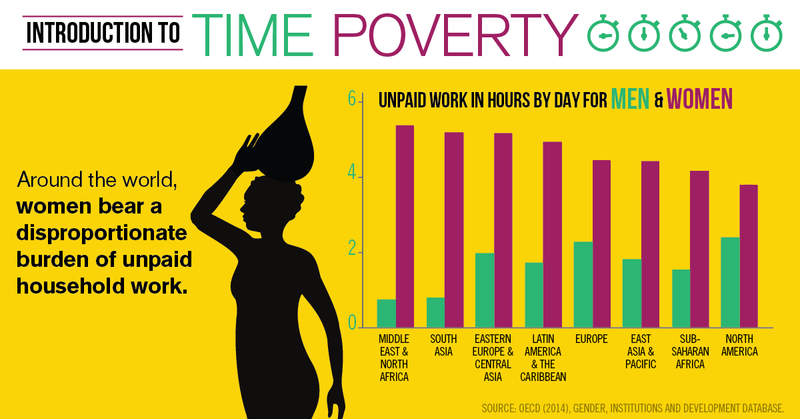 Around the world, the time gap is even more skewed: In India, to take one example, women spend 6 hours every day on unpaid work, compared to less than 1 hour for men. 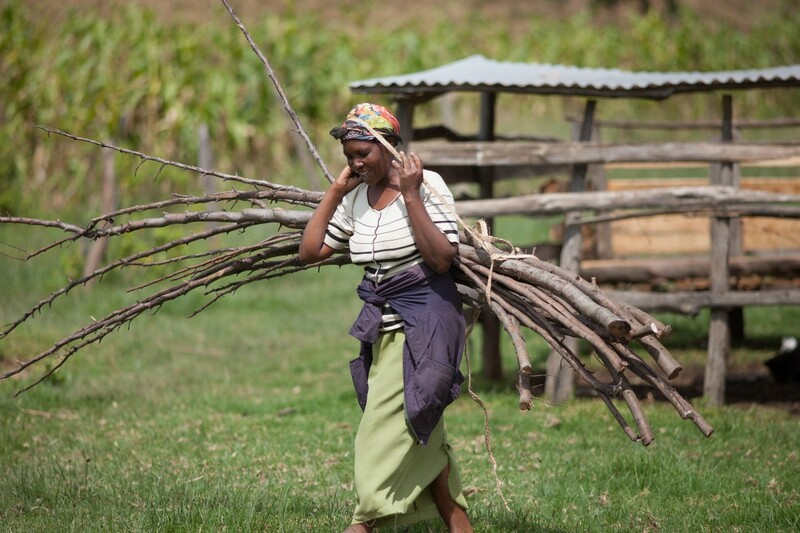 In the poorest places, the burden of housework is much more physically demanding and takes a lot more time than it does in America and other developed countries, in large part because women don’t have the benefit of time-saving devices like gas stoves and washing machines. When I visited Tanzania a couple of years ago, I spent a few days with Anna and Sanare and their six children. Anna’s day started before dawn when she lit the fire to cook breakfast. After we cleaned up, we fetched water. Once Anna’s bucket was full, it weighed 40 pounds. After making lunch, we went into the forest to chop wood for the next day’s fires. Then we went for more water, then milked the goats, then made dinner. We were up late into the night, washing the dishes. Time poverty is an important underlying cause of economic and social poverty in developing countries. Women like Anna have to spend so much time maintaining a household that they are forced to make devastating tradeoffs — for instance, skipping school or doctor’s visits, or passing up the opportunity to start a small business that would bring in extra income. The stakes of time poverty are very different depending on whether you live in a country like Tanzania or a country like America. But no matter where you are, the opportunities available to women and girls are limited by the fact that their time is routinely assigned for them simply because they are female. The good news is that anyone can help solve this problem, because gender norms affect everyone. Public policies like affordable child care and paid family and medical leave for both parents can help reduce and redistribute unpaid work. Ultimately, though, the solution depends on us recognizing the hidden assumptions that exist in our own lives — and then challenging them. I don’t know if 10,000 hours really makes you an expert at something, but I can say this with confidence: billions of women with tens of thousands of hours leads to a better life for everyone. At the United State of Women Summit on June 14, some of the world’s boldest thinkers on women and girls’ issues will tackle tough questions about gender equity and economic empowerment. Tune in to watch the live stream.